The 2017-2018 edition of the men's hockey squad finished with a record of 15-14-4, and 11-8-3 in conference play. 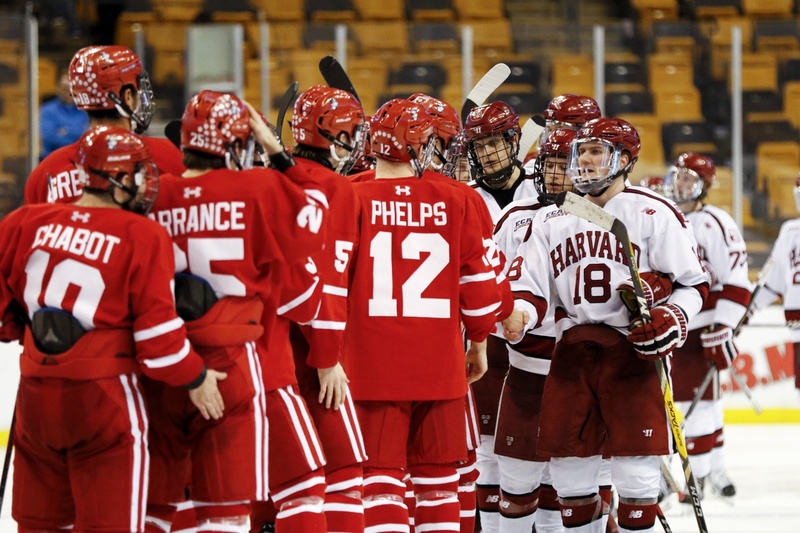 With the NCAA men’s hockey tournament finally concluded, Harvard will jump from its brief offseason into spring training. 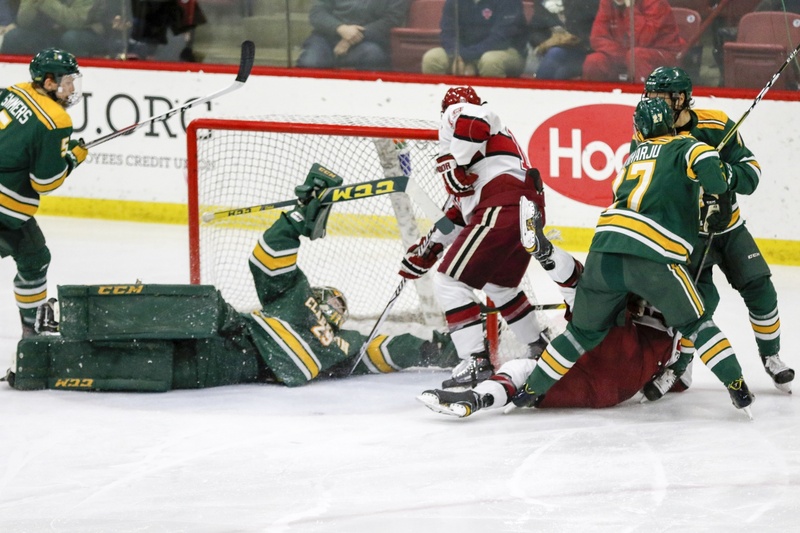 Before looking ahead to 2018-2019, though, the team must reflect on a season full of ups and downs, perhaps best exemplified in the ECAC semifinal overtime loss to then-No. 10/8 Clarkson that put the Crimson out of business. After jumping out to a 4-1 lead mere seconds into the third period, the Crimson was staring at the chance to earn a second straight Whitelaw Cup, given to the postseason conference champion. In the earlier semifinal, Princeton—a team that Harvard swept this season—had bested then-No. 2 Cornell. With a streaking yet beatable Tigers squad waiting ahead rather than the Big Red, which shut down the Crimson in both of the teams’ meetings this year, Harvard liked its chances to play its way into the NCAA Tournament. The team, of course, never had that opportunity. Instead, the Golden Knights escaped the jaws of defeat, scoring three unanswered goals to tie the game and then another to steal it in the extra frame. And so it was all season. While the Crimson witnessed spurts of offensive brilliance and a banner year from junior forward Ryan Donato, the group seemed unable to find its groove for sustained periods of play, and uncertainty in net didn’t help either. Short of winning a national championship, Harvard managed to accomplish almost everything a Boston-area hockey program could hope for in the 2016-2017 season—a Beanpot title, an Ivy League crown, ECAC regular season and playoff championships, and the school’s first Frozen Four appearance since 1994. After the historic season finally ended at the hands of tournament runner-up Minnesota-Duluth, the Crimson graduated the highest-scoring senior class in the country and began 2017-2018 with the aim of fulfilling its own high expectations. Madsen was coming off a season of personal bests too, starting all 36 games and still finishing the year with a stingy .923 save percentage. Preseason polls this year demonstrated exactly how high outside expectations were. Both the coaches’ and media polls projected Harvard as the top ECAC seed, while national rankings put the Crimson at No. 2/3— matching its highest USCHO position since the ranking system began in 1997—even without its dynamic class of 2017. The spring prior, Harvard had chosen three captains for the first time in program history to guide the squad back to the Frozen Four. Madsen, Horton, and fourth-year forward Eddie Ellis would wear letters for the team. A promising freshman class joined the Crimson, including two NHL draft picks in forward Jack Badini and defenseman Reilly Walsh. The new team tested the waters on Oct. 21 in an exhibition game against the United States National Team Development Program’s U-18 squad. The Crimson hosted the USNTDP U-18 team in an exhibition for the second consecutive year. Lackey, Fox, Solin, and Walsh on the Harvard team all played with the program before college. While the 7-2 Harvard victory meant nothing for the season in terms of points, some aspects of the game foreshadowed the season to come, such as Donato’s hat trick—completed less than five minutes into the second period—and offensive contributions from Walsh. The yearly turnover was also happening behind the scenes, as younger players took on greater leadership roles. Bowlby's rookie campaign featured an absence due to illness, but the forward still finished fourth in team goal-scoring (8). A week later, the Crimson began its season in an unusual Sunday tilt against Ivy opponent Dartmouth and put on a clinic for a 5-0 win. This was Harvard at its best: a perfect save percentage from Madsen, execution on the power play, and a high-octane mentality even after taking the lead. Freshman forward Henry Bowlby broke the ice, snagging his first collegiate goal before the halfway mark of the opening period. The Crimson carried the spark of its auspicious opener into the following weekend, when it played host to rivals Yale and Brown. 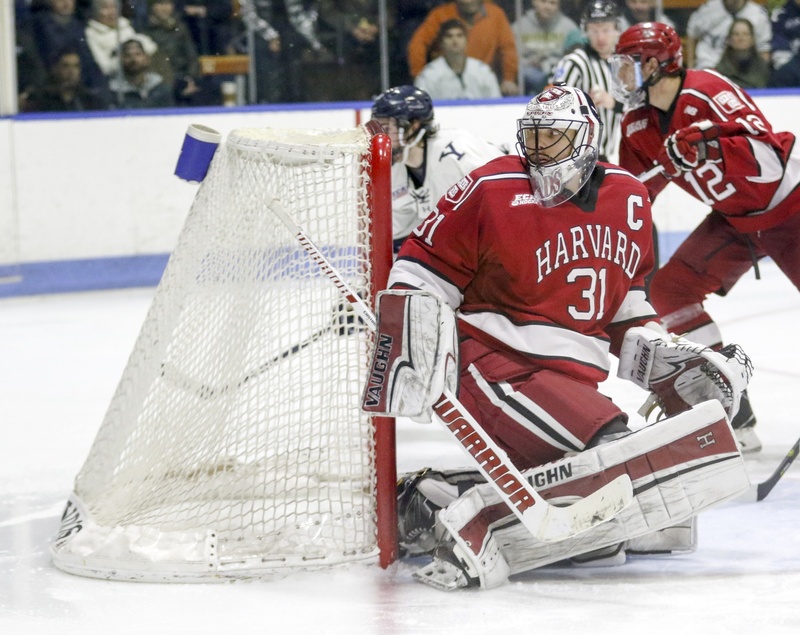 Despite rallying in the second period and scoring twice to tie the game, Harvard could not hold off Yale's pressure. There, the team hit an unexpected stumbling block and fell, 5-2, to the Bulldogs for the first time in over a year, breaking a long stretch of undefeated play at the Bright-Landry Hockey Center. When the tied contest grew heated, Harvard—normally one to play fast rather than physical—took one too many penalties, and Yale made the squad pay. “Early on in the season, we found some ways to not end up with the result we wanted,” said coach Donato, reflecting on the season. A shutout win against the Bears offered some consolation, with the offensive-minded Walsh notching his first two goals and cementing his slot beside Fox on the top power play unit. But with Brown dispatched, Harvard was set to face the most daunting stretch of its season: a program-record nine-game road stint that would keep the team away from home until 2018. Granted, those nine games spanned two months and the holiday-season hiatus, so the Crimson did have some breathing room in between road series. Additionally, one tilt was just across the river at Boston College. But November and December would still present Harvard with some of its most challenging opponents—as well as its most hostile venues—of the campaign. 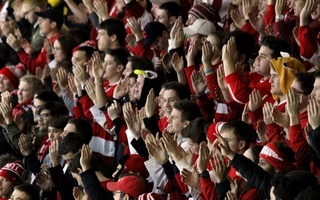 The fishy jeers of Cornell’s packed Lynah Rink, not to mention the team’s largest crowds of the season at Minnesota’s 3M Arena at Mariucci, made the road gauntlet that much more taxing. Harvard was immediately put to the test against an underestimated Colgate squad. 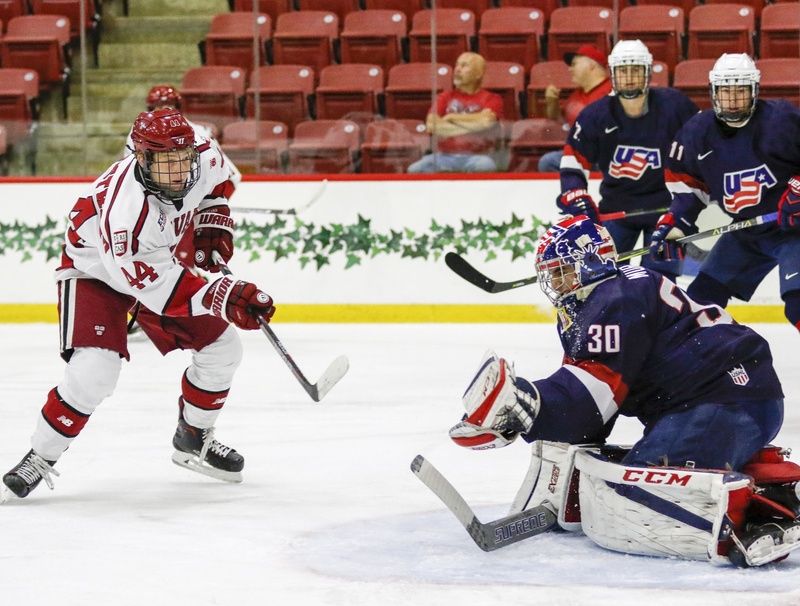 A tight contest ended in a 2-1 loss, chiefly at the hands of Raiders sophomore net-minder Colton Point who would once again punish the Crimson in late-January. The very next night, the visitors suffered a heartbreaker against the Big Red, then ranked No. 14/12. A tense tie game was broken just 2.3 seconds before the final horn by Cornell senior defenseman Alec McCrea, sending Lynah into seventh heaven and handing the hosts a 3-2 win. Meanwhile, Harvard left frustrated and without a point on the weekend. Lynah Rink in Ithaca, N.Y., is never a hospitable venue for the Crimson, who were victims of both a crushing loss and flying fish. During Harvard-Yale weekend, the Crimson jetted to St. Paul, Minn., for a rare two-game matchup against the No. 6/7 Golden Gophers. The Crimson hoped to put a dent in its all-time winless road record against Minnesota, but as was frustratingly characteristic on this roadie, the squad still fell short, first by a score of 4-2 and then 2-1 in overtime. For Minnesota natives on the Crimson, the trip to their home state held familiarity without the satisfaction of winning. All the while, the team saw its place in the rankings slip until Harvard dropped out of the USCHO’s top 20 for the first time in 78 weeks. After the Crimson lost four straight games for the first time since Feb. 7, 2015, its record stood well below .500 by the time it faced then-No. 13/14 Boston College. The Eagles had begun their season with a dismal 1-5-1 record in October, playing against only ranked teams, before completely reversing their fortunes and winning seven straight contests in November. The head-to-head resulted in a raucous 4-4 tilt that entertained audiences as much as it must have dismayed both coaching staffs. For Harvard, the battle at Conte Forum closed out a November best left forgotten: the squad was outscored 15-20, and tri-captain goaltender Merrick Madsen, thought to be the runaway choice for starter after his stellar 2016-2017 campaign, was the owner of a disappointing .897 save percentage. Perhaps the only bright spot in the winless month was a career-best eight-game point streak for Donato (4–6—10), who led the team in scoring. Harvard opened its December play with an impossible-to-miss difference. When the squad traveled to Quinnipiac and Princeton, the coaching staff chose to swap Madsen for junior backstop Michael Lackey, breaking the fourth-year’s 55-game start streak and giving rise to a goalie contest that would persist through the end of the season. Starting against the Bobcats, Lackey turned aside a career-best 41 shots for a sturdy .953 save percentage. The change energized the squad as much as it gave Madsen a chance to rest and reset. For the first time all year, the Crimson cruised to back-to-back triumphs as it defeated the Bobcats, 6-2, and then prevailed over the Tigers, 5-2. “The two-game sweep right before our break...set the tone for what we could become as a team in the second half [of the season],” coach Donato said. Though the team still owned a sub-.500 record, it looked like the Harvard group that most people, including and especially the players in the locker room, expected ahead of the campaign. Entering the December break, Lackey was named ECAC Goaltender of the Week, and offensive playmakers such as Donato, junior forward Lewis Zerter-Gossage, and Walsh were marking up the scoresheet. Donato tallied his second career hat trick against Quinnipiac, and Walsh’s scoring burst seemed to arrive at the perfect time, as the Crimson would be missing the dynamic talents of Fox for the last weekend of December. The sophomore sported the red, white, and blue at the World Junior Championships for the second year in a row, this time donning the “A” as well for the bronze-medal team. 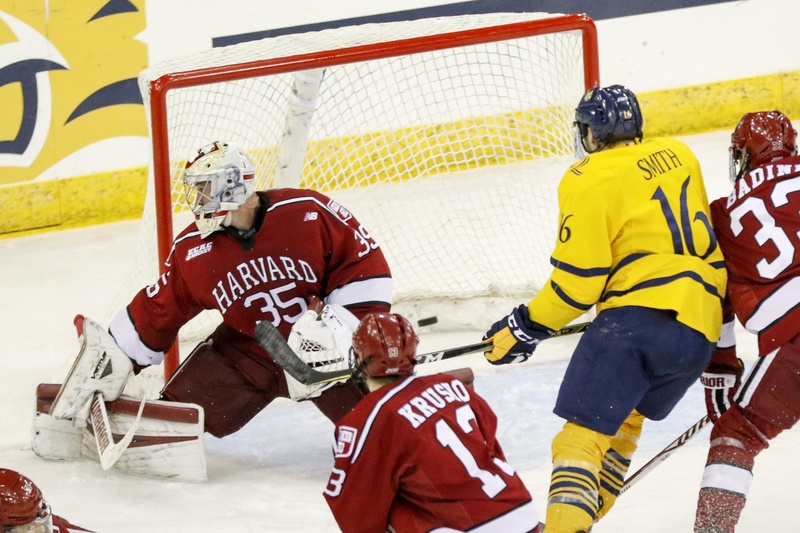 Fox or no Fox, Harvard split its Catamount Cup contests against UMass Lowell and UVM. The first matchup resulted in a 5-2 loss, while the latter was a 4-1 victory on the back of yet another Donato hat trick. The junior’s whopping eight tallies in four December bouts earned him national Player of the Month awards and extended his scoring streak to 12 games. More importantly, perhaps, it also helped propel the Crimson to .500 in conference play. Madsen's shutout versus RPI didn't come easy—the senior net-minder saw 32 shots come his way, but shut the door on all of them. “Building up” is exactly what happened. January marked a welcome return to the friendly ice of Bright-Landry, and Harvard played host to Union and RPI. Madsen turned over a new leaf against the Engineers, stymying the visitors for his 10th career shutout, 50th win, and a 3-0 victory. Bowlby played spoiler against the Dutchmen in a 4-3 overtime win, scoring the tying goal as well as the sudden-death winner. The two wins weren’t the only happy news for Crimson fans as they rung in 2018. On New Year’s Day, Donato, in addition to former captain and defender Noah Welch ’05, was named to the Team USA Olympic roster. For Harvard, however, Donato’s February departure would mean the loss of its top point-getter and goal scorer. For the next few weeks the Crimson would have to prepare for the void left by his absence. 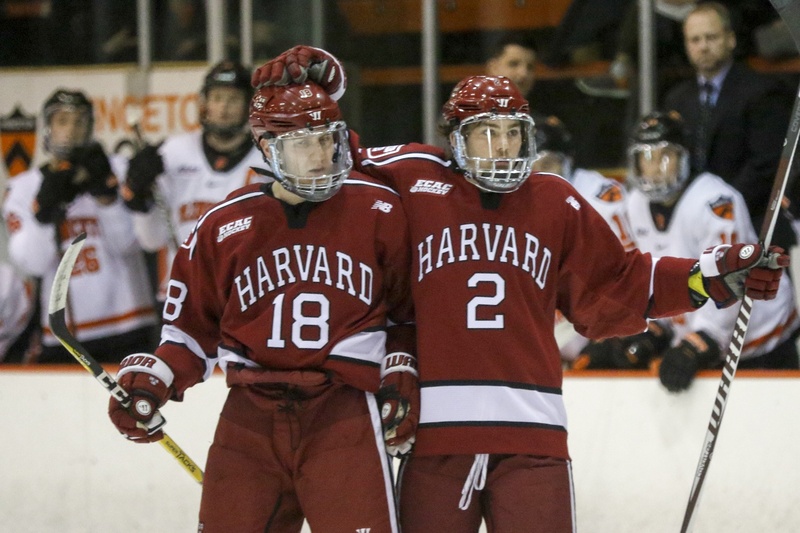 Harvard completed its sweep of Princeton and tied both RPI and Quinnipiac before heading up to the “North Country.” Between ECAC bottom-dweller St. Lawrence and then-No. 2 Clarkson, the latter was the obvious competition, but both contests were close. The Golden Knights wreaked havoc in a 6-6 contest which featured an avalanche of goals that all net-minders involved probably would have liked back. The following evening, a three-point night from Zerter-Gossage and an OT winner from rookie Badini vaulted the Crimson past the Saints, 4-3, giving the team three of four points on the weekend. The squad’s dramatic turnaround had yielded a respectable 8-3-3 conference record. Opponents tend to see a lot of the Crimson's shot-first offense, and Point was no exception. But the sophomore denied no fewer than 51 shots for a career best. But ahead lay a home double-gamer against Colgate and Cornell, teams that had frustrated Harvard back in November. 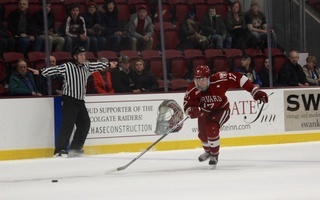 Two formidable foes awaited in net: Point for the Raiders, and Big Red freshman Matthew Galajda, critical pieces in shutting down the Crimson earlier in the season. Unfortunately for Harvard, revenge was not in the cards. Despite outshooting opponents by an incredible 86-49 margin, the Crimson was held entirely off the scoreboard that weekend, falling 3-0 to Cornell and 2-0 to Colgate. A 4-1 win at Dartmouth the next weekend, though it provided some redemption for Madsen in net, did little to dispel the frustration of a season sweep at the hands of both upstate New York teams. Suddenly, the goaltending question seemed all the more urgent, and Donato’s trip to South Korea was looming. There was no time to sit and ponder these concerns, however. It was February, and that means Beanpot season. In a rematch of last year’s Beanpot final that handed Harvard its first title in 24 years, the team headed to TD Garden to face Boston University. 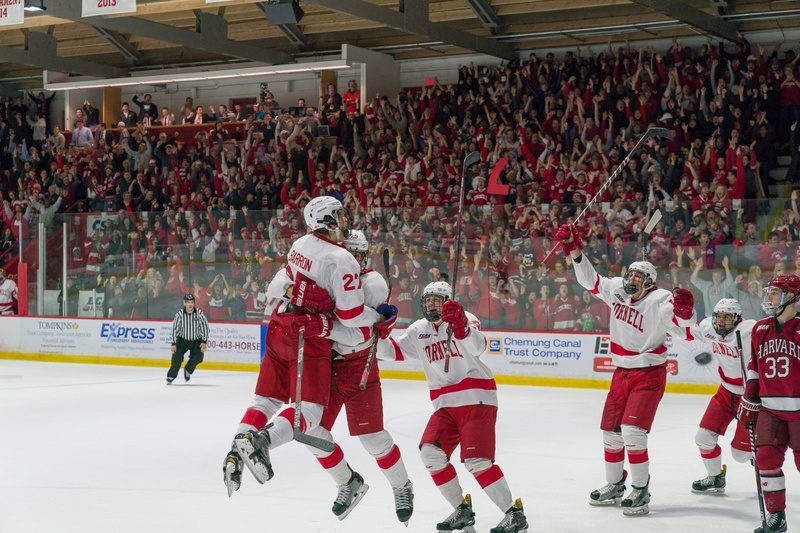 In some respects, the local hockey classic means as much to coaches and teams as a Frozen Four appearance does, and the Crimson’s desire to repeat as champions clashed with the Terriers’ desire to avenge 2017’s 6-3 defeat. The teams were an even match for most of the contest—and it was certainly a long contest, with the confident net-minders keeping play going into a second overtime frame. Harvard, however, hadn’t scored on 15 straight man-advantage opportunities, and failure to cash in on those chances inevitably led to heartbreak. A seemingly innocuous shot beat an otherwise solid Madsen, and the door shut on the Crimson’s Beanpot defense. 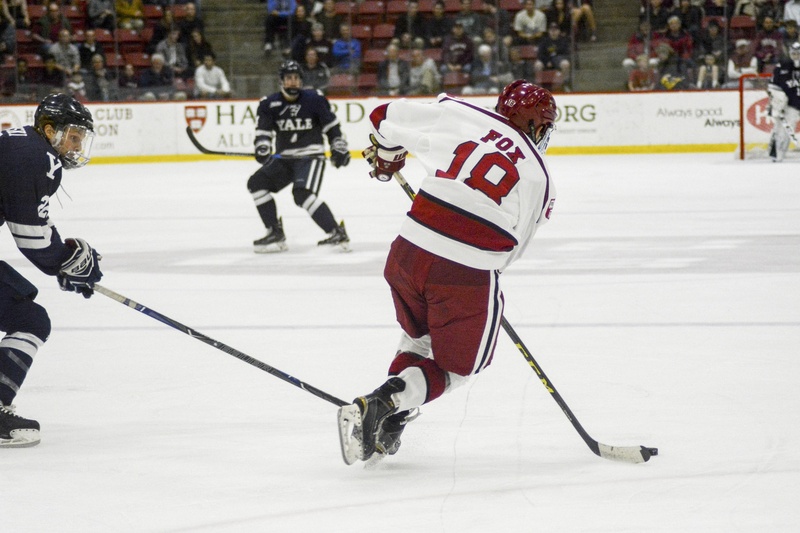 In a battle that lasted nearly 82 minutes, the Crimson eventually were knocked out of the running for a Beanpot title by a young Terriers squad. 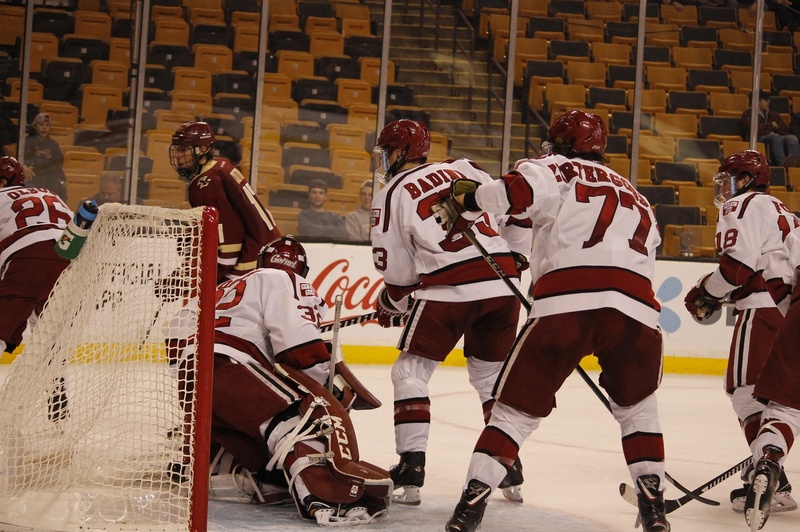 Offensive worries compounded when Donato departed and Harvard fell, 3-1, to Union between Beanpot matchups. The early part of the Beanpot consolation game against Boston College seemed just as lackluster, despite sophomore backstop Cam Gornet making a surprise start—his first. But then, the action ramped up. A 1-1 tie became a 4-2 Crimson lead, only to be snuffed out by Eagles rookie forward Logan Hutsko, who completed his hat trick in less than 12 minutes to bring the score to 4-4. Senior forward Seb Lloyd, though, played the hero for Harvard, scoring early in the extra frame to secure third place in the tournament. Debuting under bright lights, Gornet stymied the Eagles for a good stretch of play—until a few too many penalties and a determined Logan Hutsko took over. 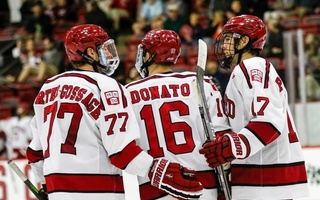 As the senior class skated away from its final Beanpot, more lasts lay ahead. For senior weekend, the Crimson hosted St. Lawrence and Clarkson, looking to end the fourth-years’ time at the Bright on a high note and clinch an ECAC tournament bye. What followed was a pair of contests characteristic of Harvard home hockey. Adam Fox hadn’t tallied a single goal so far in the 2017-2018 season. But when it rains, it pours, so Fox notched his first career hat trick against the Saints, the first trio of tallies by a Crimson defenseman since 2011. 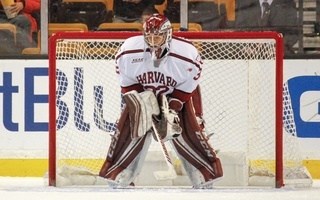 Lackey was particularly sharp in net, keeping out every St. Lawrence attempt en route to a 5-0 Harvard win. The momentum stayed with the hosts against the then-No. 7 Golden Knights. The power play fired on all cylinders and Madsen redeemed his January performance in a 5-2 Senior Night victory, the team’s most complete game of the season. Both sophomore Adam Fox and freshman Reilly Walsh, pictured here against Princeton, potted goals in a 5-0 victory over St. Lawrence. With a conference playoff bye in hand, the Crimson prepared to close the season out at Brown and Yale, adding Olympian Donato to an already surging team. 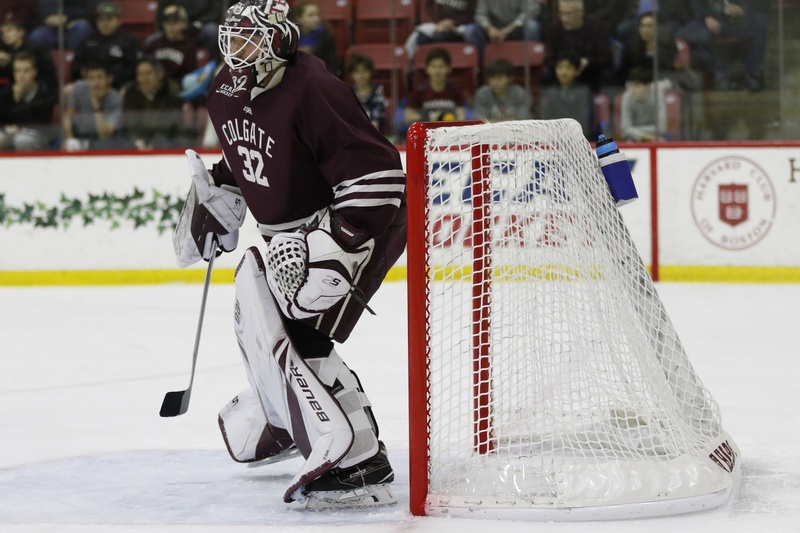 But the Bears stunned a disjointed Crimson squad, 6-4, and a raucous night at the Whale witnessed the Bulldogs complete their sweep of Harvard after a goalie duel ended 2-1 in the Elis’ favor. 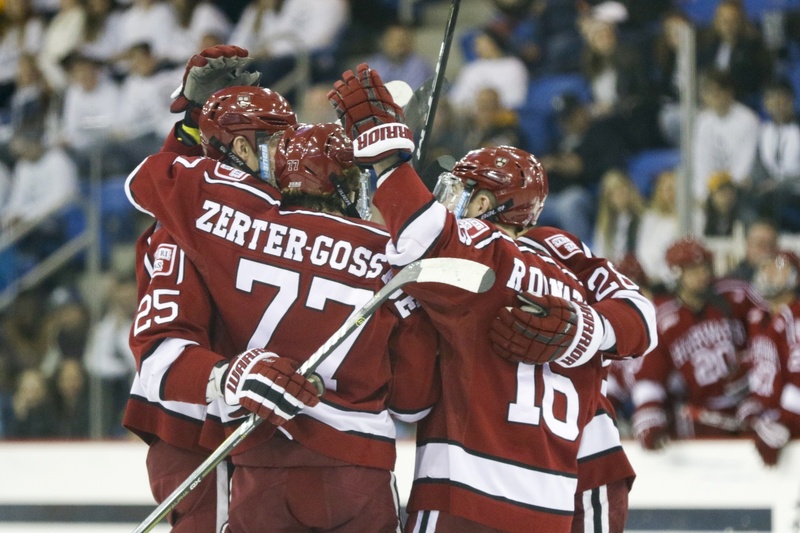 The Crimson would have to settle for fourth seed in the ECAC after winning the Cleary Cup the year before. Having trained through the bye week, Harvard opened its Whitelaw Cup defense against familiar Ivy foe, fifth-seeded Dartmouth. The Big Green had defeated St. Lawrence in three games, and stormed into Cambridge with a noticeable jump. 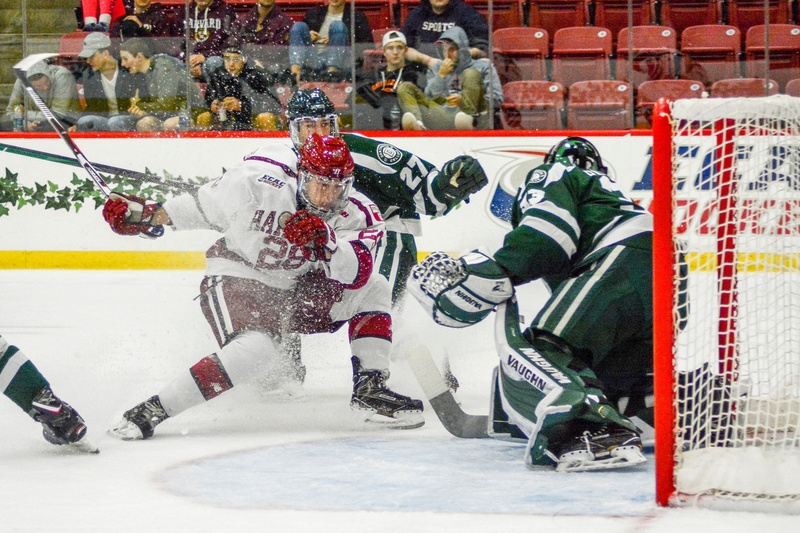 Senior goaltender Devin Buffalo had suffered much at the hands of the Crimson in the regular season, but his glove was hot—a fact that showed in Dartmouth’s decisive 4-1 win in game one. 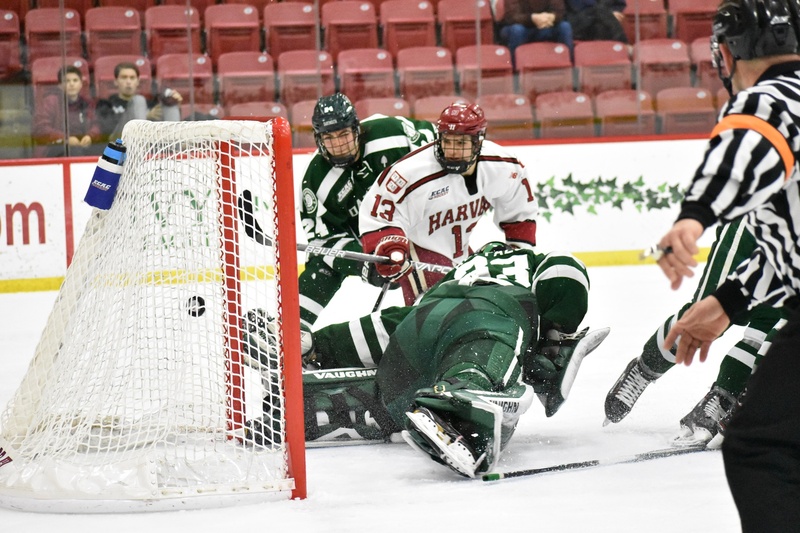 Harvard’s offensive surges met unflinching resistance in the Big Green’s defense, and the hosts could only resolve to be better in game two. “Once again, for a lot of these guys going into playoffs and Placid, it was the first time they’d played in the games themselves or had significant roles in the games,” Horton said. Harvard stormed back to tie the series after a dominant performance all around—two goals from Fox, controlling faceoff play from Donato, and yet another contribution from Krusko (pictured). For the first time, the Crimson had more than just honor on the line—a game two loss would mean the end of the 2017-2018 season. But luckily for Harvard fans, the squad stepped up to the plate, scoring four times in the second frame for a 7-1 drubbing of Dartmouth. The message was clear: coach Donato’s group was far from finished. In game three, a hat trick from none other than Donato and a two-point night from Fox powered the Crimson to the ECAC semifinals for the fourth consecutive year, meaning not a single athlete on the Harvard roster had ever missed the tournament in Lake Placid. Jake Kielly conceded 12 goals to the Crimson in three matchups this year, but came away with the win that mattered as Clarkson moved on to the ECAC final. Yet, with the NCAA Tournament in sight, the Crimson stumbled at the hands of Clarkson, and just like that, the 2017-2018 season with all its highs and lows was over. Harvard has now said goodbye to one of its winningest senior classes and closed the book on a fairytale Donato season and career. 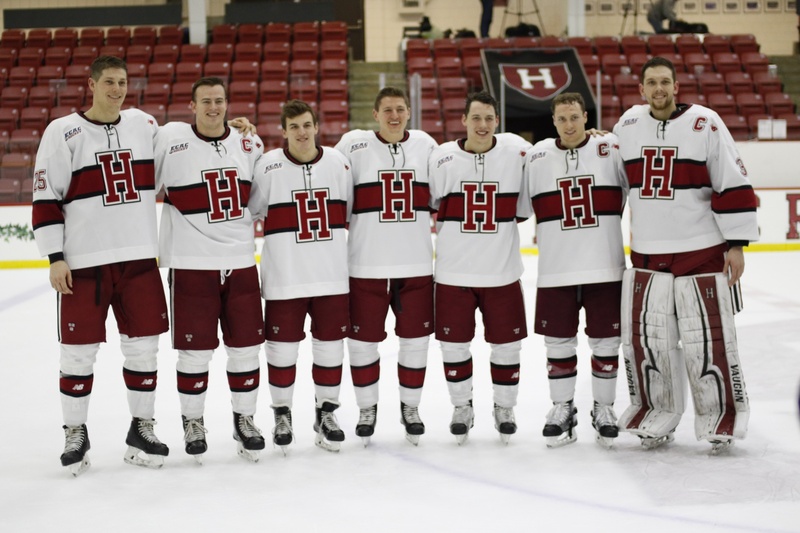 Harvard's senior class leaves behind 82 wins and marks on both the record book and the program culture. In many ways, though, the team’s offseason retooling will be akin to 2017’s. 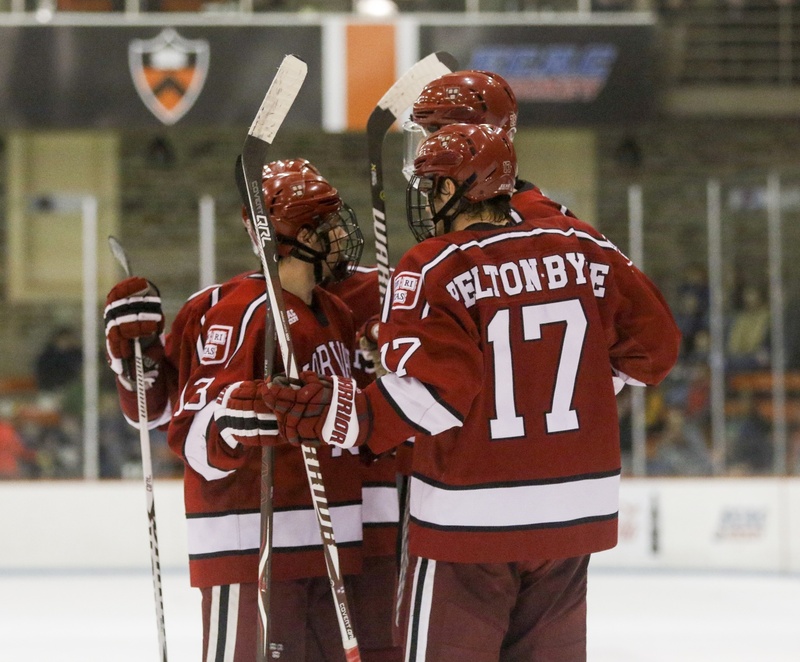 Once again, the Crimson will have to replace its top-line center—perhaps sophomore winger Ty Pelton-Byce will find himself taking opening faceoffs, as he manned the middle of the ice quite ably during Donato’s Olympic sabbatical. 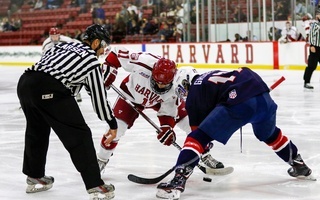 Sophomore John Marino seems poised to take over fourth-year Wiley Sherman’s role as primary shutdown defenseman, but if Harvard wants to replicate Sherman’s formidable 6’7” presence, it will need to look further. The team’s offensive-minded defenders, at least, are locked into place. Walsh and Fox will continue to have significant roles and anchor the top power play unit—Fox confirmed in March that he would not be joining the NHL’s Calgary Flames next year and would continue with the Crimson instead. Madsen’s record-breaking career leaves a vacancy in net, too. Presumably, Lackey will find himself in that position, with Gornet backing him up. 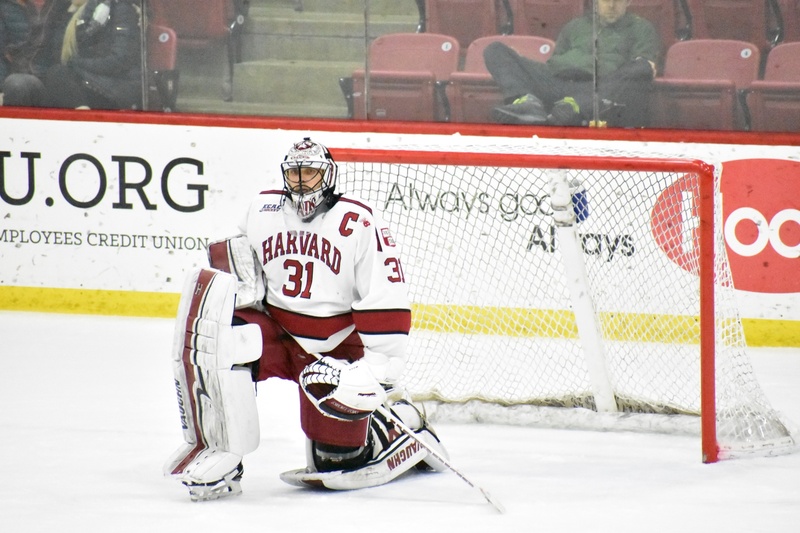 If Harvard’s faithful have learned anything this season, however, it’s that coach Donato is unafraid to reward merit between the pipes, even if it means benching his number-one backstop. Talented sophomore and freshman classes will take on even bigger roles come next year, and some of this season's breakout performers could see regular top minutes. Before next year, though, comes this summer, a season devoted to recovery and training. Some players skate on their own in the offseason, while others will remain in Cambridge, fine-tuning aspects of their own game. Come October, the curtain will rise on a new season, and even though the class of 2018 will no longer be suiting up at the Bright, its members will be cheering from afar. —Men's hockey co-beat Spencer R. Morris contributed to the interviews for this story. He can be reached at spencer.morris@thecrimson.com. Follow him on Twitter @SMorrisTHC.